Growth of Flexible Workspace: What Can Commercial Real Estate Learn? Seismic shifts in customer demand have caused radical re-thinking across numerous industries over the past two decades. Head of Marketing John Williams and Research & Insight Manager James Rankin investigate. An overriding trend has been the shift towards service-based models, in many cases enabled by digital innovation, and the inevitable repercussions in terms of cost models and business structures. Many industries are now unrecognisable from their previous iterations only a decade ago. Commercial real estate is undergoing an evolution of its own as increased demand for flex space and innovation around the office models for procurement and operation are leading to profound change; with much of this centred around the provision of workspace as a service. This growth in more flexible working, enabled by technology and the changing attitudes of business, has seen how organisations find and occupy offices radically evolve. 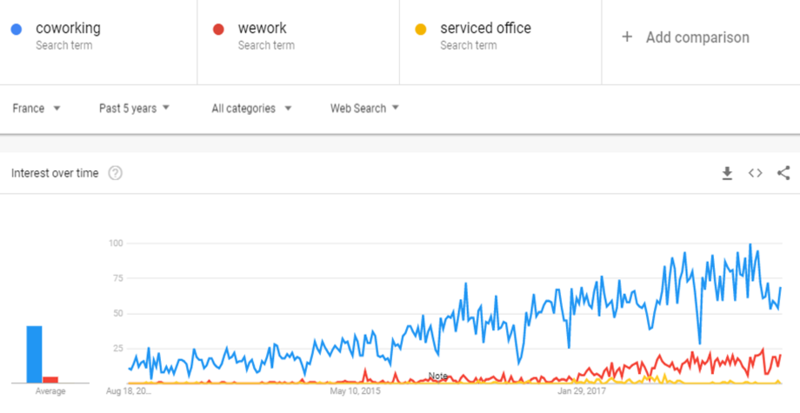 “Co-working” is a phenomenon that has shaken up commercial real estate and led to the development of one of the biggest “unicorns” – multi-billion $ WeWork. But really, that is only half the story. What Can Workspace Learn From Other Sectors? 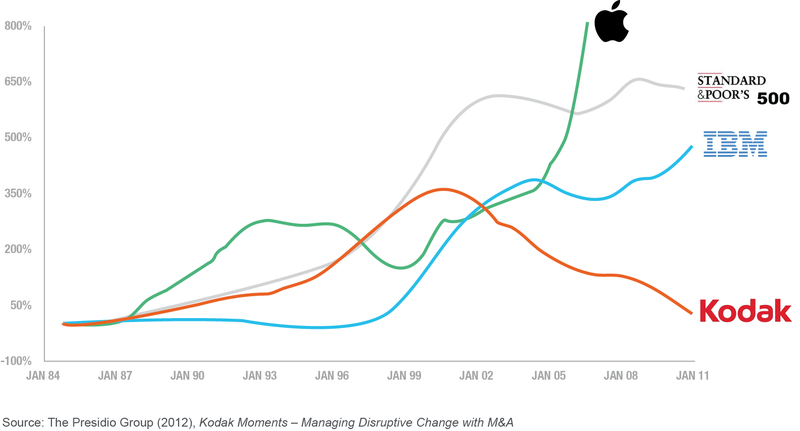 The corporate carcasses of once global giants such as Kodak are fading from memory as failure to move with market dynamics left them with nowhere to go but irrelevancy. Contrastingly, IBM, the world’s oldest “tech” brand in many ways, continues to innovate, having been an early adopter of a service-based platform. There are countless telling examples of similar “innovate or die” stories across the technology sector. Cloud-based services have grown over the last decade, spawning global tech giants such as Salesforce, Oracle and SAP in a relatively compressed timeframe. This new service-based model has been both a cause and effect of other changes that are profoundly impacting business models across multiple sectors. The availability of transparent pricing and the competition this encourages is enabling companies to become more agile and to focus on their core business functions – for example, services such as IT can now be operated by a third party or stored off-site via the cloud. In a short amount of time, the concept of the server cupboard or a large in-house IT team has become a throwback to the early days of technology. B2B firms are mimicking the evolution of the B2C marketplace as customers place more value on the immediacy of delivery and easy to digest service, rather than a bespoke end product. Are We Heading to a Future Where Nothing is Owned Anymore? In the entertainment industry, subscription services allow an individual to have far greater flexibility and variety in what they consume, and they are willing to pay a premium for this service. The success of this model now also sees the companies providing the digital streaming services becoming the content providers too, with both Netflix and Amazon Prime’s programming budget now dwarfing those of long-established film studios and TV channels. They have innovated far beyond their initial iteration to become both content enabler and provider, in both cases fuelled by limitless ambition and an agile approach to their business model. 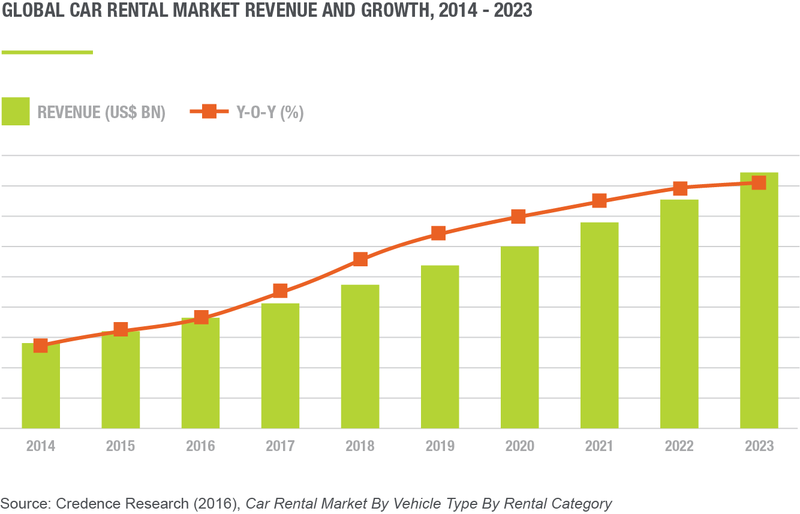 The automotive industry is undergoing similar change, with the global car rental market expected to double in value between 2015 and 2022 as consumers change their outlook on owning a vehicle. The requirement to “own” a physical asset is now viewed as an inefficient use of capital, particularly with limited resale value and inherent risk attached to the ownership and liability for repairs. As well as the dynamic growth in the car leasing market, car sharing platforms are also among the fastest growing tech start-ups in the world. On-demand access to vehicles is increasingly viewed as a service – as much as, say, video streaming – and the potential of driverless technology may render the physical possession of cars totally redundant. How long will it be before car manufacturers have to move to this model to remain competitive? How Does the Workspace Model Compare? The dynamics that are driving demand for flexible office space are very similar to those we have seen create change in so many other industries. The need to minimise CAPEX, promote growth and maintain an agile approach to business are objectives that flex space helps companies achieve while retaining focus on core business functions. The importance for a business to react rapidly to change is increasing as fluctuating demand, financial market instability and radical changes in technology are all impacting business planning. Plans are now typically set out for five years at most, and this timeframe is set to continue to shrink. The CEO survey by PWC highlighted that not only do 51% of CEOs expect to enter into a new alliance in the next 12 months, but 63% are currently planning for no more than three years ahead. The demand for flexibility in response to market uncertainty is creating conflict in many established industries that have seen little need for systemic change in their supply chain over the last 50 years. The commercial real estate sector is such an example in the B2B world. In the B2C environment, the fashion and clothing industry is another clear example, although the B2C property market is already experiencing disruption with the rise of online agents. These are industries with historic value chains that have only recently seen disruptors start to impact long-established business structures. 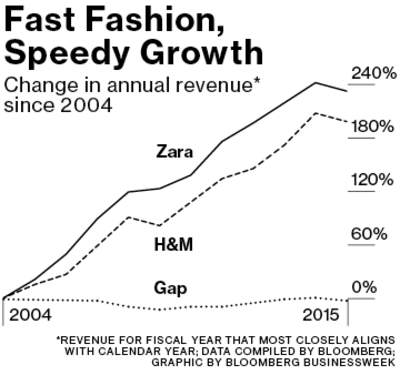 In fashion, we have seen the likes of Zara and H&M change the way they operate within a traditional industry and introduce supply chains that can react to changing consumer demand. This means that while they may not charge any more for their products than their competitors, they are able to reduce wastage and oversupply, and maximise profits, thereby allowing them to outperform challenging market conditions. The commercial real estate industry is seeing similar disruptors emerge in a sector where the value chain has altered very little for 100 years or more. However, now the market is moving faster with flexible workspace operators that are focused intently on customer demand. Their model is reliant upon creating a service that reacts rapidly to client requirements, providing a mix of amenity space and workspace that can be tailored to very specific client needs. 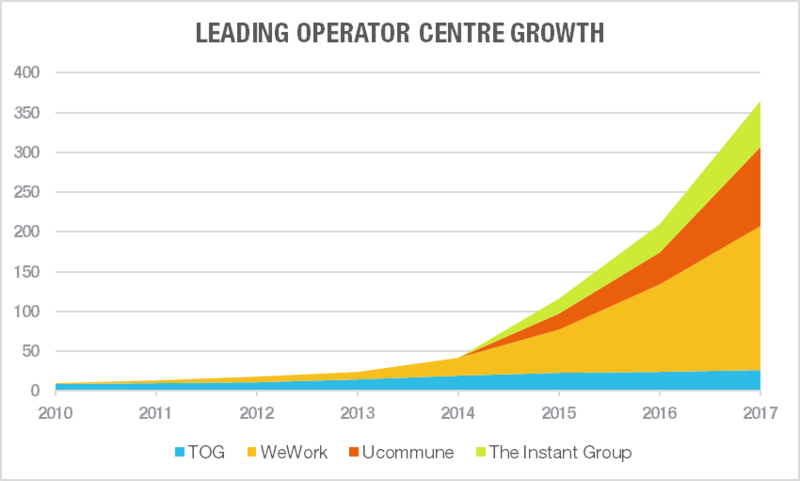 The expansion we are seeing at present from the leading operators in the flex market matches the activity seen in other industries during the early stages of business evolution. Not only are some of the leading providers continuing to increase their rate of growth, but are forecasting even stronger activity looking ahead. If we look at our industry from the perspective of atypical business growth models, we would propose that, despite companies such as Regus operating for over 25 years, we are only really in the “Early Adopters” stage of evolution. To be more precise, we expect that we are in the top 3rd of this stage of sector maturation. Looking at the adoption curve below, we can see that this stage is characterised by high growth in the early stages of change, and we can expect a dip in positivity before true majority adoption occurs. Just how much client sentiment cools and expectation dips is still to be seen, but after several years of very high growth and fast expansion in the flex workspace market, we would anticipate a period of maturation. In other industries that have experienced this process of industry evolution, there has been a number of mergers and acquisitions as the leading companies try to maintain growth and maximise scale. During this period of rapid growth, we can expect to see larger potential customers take time to fully understand the movement in the industry and determine how their businesses can best react. Cloud computing is one such industry that is far more advanced in this adoption cycle. While the principle was first discussed in the 1960s, it wasn’t until 2006 when ex-Google CEO Eric Schmidt introduced the term that it started to enter its early adoption stage. According to a Gartner study, it took another seven years for penetration in the B2B space to reach 26%. From this point, adoption is reported to have more than doubled in just three years as the early majority bought into the technology and the rest of the market finally jumped in. Fig. 5 – The S-Curve of Business Evolution and Development. 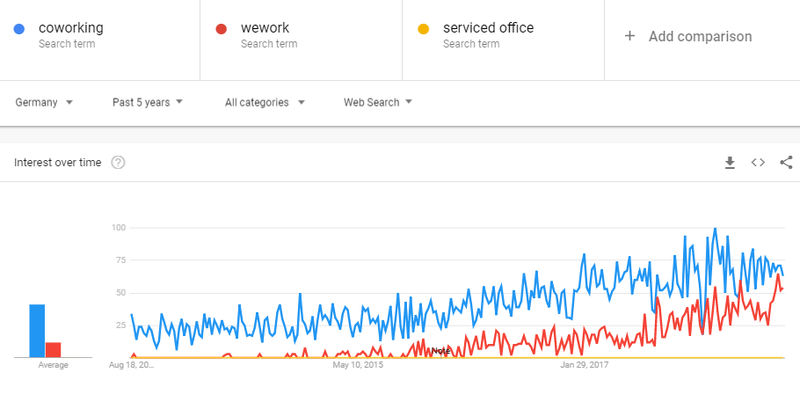 The graphs below show how users of Google have increasingly been searching for “Coworking” compared to previous years, alongside the increased supply that The Instant Group has tracked within the same markets. There has been much speculation rooted in whether the growth of flex workspace and “co-working” can be maintained. Many industry commentators still focus on the concept that somehow occupier demand will spring back to conventional leases and that this is a temporary trend. Data from Google tells a different story, and shows just how radical this growth in consumer demand has been. This is a consistent pattern in terms of major countries and global regions as a whole. The provision of centres offering flex space has expanded to meet this demand. Albeit from our own market view, demand for co-working and other types of flex space outpaces available supply. As client awareness of the possibilities of flex working increase, demand surges as new options avail themselves to the end user. The office market is finally becoming a sector that caters to the requirements of the end user rather than an investment vehicle that serves the landlords. In Europe, there has been a “BREXIT” effect that has undoubtedly contributed to UK-based businesses looking at flex solutions across the UK and Europe’s capitals. The Instant Group has seen the flexible markets in France, Germany and the Netherlands, to name a few, expand quickly from both a demand and supply point of view since the referendum vote. 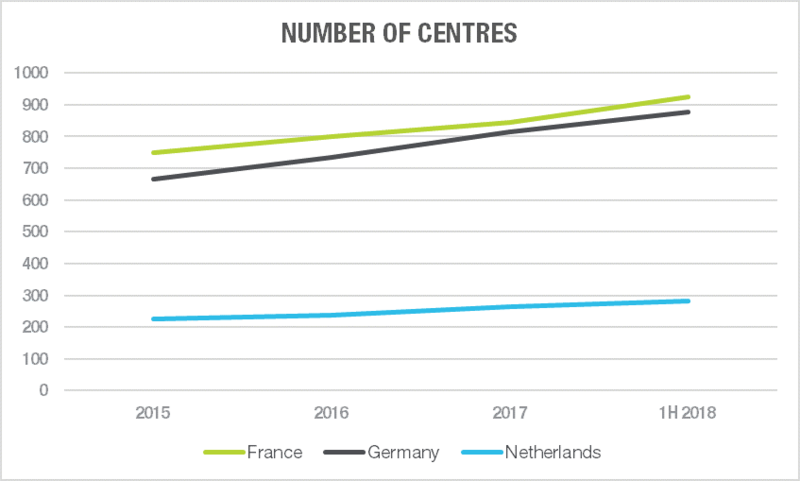 BREXIT has been a significant contributor to the expansion of flex space in Europe, but the initial seeds of a shift towards a more service-based real estate model began with the GFC in 2008. In the year following the collapse of Lehman Brothers, in the heart of the GFC, Instant tracked over 320 new flexible locations opening; and this rapid growth happened at a time when many hundreds of thousands of companies where closing. Since that time, the number of centres tracked by Instant globally has quadrupled in number from 5,484 to more than 20,000. In short, the GFC saw businesses of all sizes question business costs, of which property is invariably among the top three. The need to sign protracted leases was examined, the capital required for fit-outs of space was analysed, and the ability to move with a degree of agility became a priority for the businesses that survived the trauma of 2008 and 2009. And the solution was already available to them in many ways. Serviced offices had been around since the mid-80s, but now the product available was much more sophisticated, better designed, with more amenities available, and in great locations. And, critically, it meant you could pay on a monthly basis without massive CAPEX requirements. For small companies that were growing or even one-person members of the contingent workforce, it was a great place to start out with a new business idea. So, for a sector that has been ticking along for the best part of two decades, suddenly it became a viable option and centres for flexible workspace started appearing everywhere. In the US, among the tech hubs of the West and East Coast, start-ups using these centres started referring to this trend as “co-working,” and many actually set-up their own specialist sites offering shared amenities, a desk for the day with excellent Wi-Fi and killer coffee. Who is Using this Type of Space? Even now, the flex workspace market battles the perception that it is solely for SMEs and that shared space is not the preserve of corporates and larger organisations. The reality is that companies are dropping leased buildings in droves and turning to flex space – last year, demand in this segment of the market grew by 30% in the UK and 35% in the US as larger firms sought out space in flex workspace centres operated by a third party. They are choosing to use this space for large project requirements, or for the benefit of taking on more space for a year or two without the risk of committing to a long-term lease. For these firms, flex workspace is a low-risk way of expanding and taking on more staff without needing to commit to a more rigid model of occupancy – the lease. The shift towards service-led solutions continues to transform industries at a global level, and commercial real estate seems very likely to be the latest industry to be the next cab off the rank. It is our view that there is unlikely to be a wholesale shift towards serviced based solutions in commercial real estate. However, our current forecast is that by 2028, 20 years on from the global financial crisis, we could see as many as 140,000 flexible office locations globally – up from just 13,500 in 2008. This increase in demand will be driven by requirements from larger companies alongside the already buoyant activity seen within the SME market. Research conducted by Instant shows that today’s industry in 2018 has a little over 32,000 centres globally. Conservative CAGR estimates of 15% year on year at a global level up until 2028 would see the 140,000-prediction reached. We are currently starting to see a steadier rate of growth in the UK and the US, the most mature country markets, as we start to see the first signs of sector realignment (in line with that predicted business growth model). These markets can be expected to see renewed growth, potentially as early as 2022, as early adopters from the corporate sector move into the industry. In Asia, growth figures remain high as we continue to see increased interest from the first adopters across the region. Make no mistake, these are exciting times, and all our data would suggest that we can anticipate 15 years of dynamic market expansion, right across the global flex market. What we will see is the proliferation of choice, of client demand forcing operators and landlords to aggressively evolve their models; to differentiate and specialise. Now that commercial real estate has started to wake up to the needs of the end user, the sector will have to become smarter at finding and using big sets of data to assess, in detail, where this demand is coming from and how it is going to change over time. We are already seeing clients radically reducing the time they are prepared to wait to take on and occupy new space, and how these deals are structured. From a location perspective, the high office rents of the global cities and overwhelming living costs are seeing firms of all sizes look at what might be described as secondary locations – the vast majority of which are currently under-served by flex space providers. In each of these instances – whether it is the clients imperative to move fast, reduce CAPEX, or relocate to lower cost bases – they are going to have to look to bespoke flex solutions. This, in our view, is where the real battle for the heart and minds of the commercial real estate occupier begins in the next iteration of the sector.